Terex Cranes has expanded its Explorer series of 130-tonne capacity all-terrain cranes by developing the Explorer 5500 to slot in under the 5600 and 5800 models. 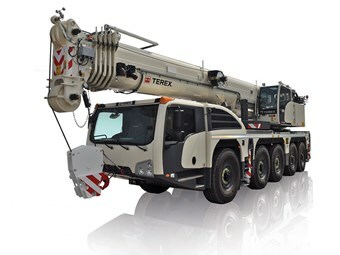 The Terex Explorer 5500 all-terrain crane. The 5500 has been designed to be compact and manoeuvrable while attaining a maximum system length of 86.5 meters and a maximum telescoping lifting capacity of 24.5 tonnes. The new crane features a 60m-long main boom, with three extensions of 11m, 21m and 33m available, all of which can be offset. The maximum load moment is 395 metre tonnes, and outrigger extension positions of 2.54m, 4.7m and 7m can be selected. The Explorer 5500 can be used within cities as well as on narrow construction sites as it has a carrier length of 12.1m, a total length of 14.3m and a width of 2.75m — a size which Terex says is more compact than any other in its capacity class. Adding to its manoeuvrability are five steerable axels and a dynamic launch control function that prevents the crane from rolling backwards on uphill grades. The crane can be adapted for various road service approval regulations through features such as variable axle loads and axle pair intervals, a dismountable main boom, transport dolly preparation and a maximum front overhang of 1.52m. Terex says it placed a strong emphasis on economic viability during development. "That is why all components for the Terex Explorer 5500 can be transported using a single standard support vehicle," the company says. "This also results in low operating costs — as does the automatic counterweight setup system, which allows the crane to be readied for operation quickly. "The electronically controlled brake system makes for lower wear and thus reduced operating costs while at the same time increasing brake power. Simple, and therefore equally cost-effective, maintenance is provided by easily accessible service points on the crane. 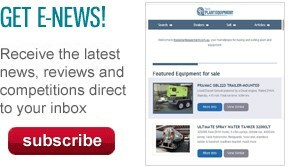 For instance, the diesel and DEF tanks can be conveniently reached from the ground." Like the 5600 and the 5800 before it, the 5500 crane is driven by a single motor which has an energy-saving start/stop function and intelligently adapts to demand. For example, it switches from high power in driving operation to energy-saving mode during crane operation. The standard motor is a 368kW unit that meets emission standards Euromot IV and Tier 4 (final). A 331kW motor for Euromot IIIa and Tier 3 is also available in some markets. In the cab, the 5500 all-terrain crane is equipped with ergonomically designed and spacious cabs for comfortable operation. "The carrier cab lacks a B-column to provide optimum visibility," Terex says, "and the superstructure cab offers ample leg room. It is also tiltable up to 16 degrees to ensure comfortable work for extended periods. Both cabs are equipped with ergonomic seats and have ventilation nozzles that can be adjusted individually." The carrier cab has a touch-sensitive monitor giving data on more than 10 operational parameters such as tyre pressure, brake system status, suspension system and axle loads. In the superstructure, the Terex IC-1 control system processes data such as load charts and working range limits. Click here to find Terex cranes for sale.